I would definitely verify that the timing is set right before you chase other things. If you're too far advanced you'll for sure have detonation. Yeah, I'd get plugs on all the vacuum ports that are not hooked up to something. Also check the rubber plugs that are on there already. Those tend to rot right at the end of the plug over time. I pulled the hose off the egr.....I thought it was the egr. Isn't that the port on the left valve cover towards the rear? It was going to the left side of the carb. He said to put it to the front if anything because my crankcase pressure or vaccuum is off causing smoke to rise up through the oil filler port. Will try to mess with it this evening if I get off early enough and it isn't raining. My guy said to check vacuum at the distributor and if constant then disconnect because wrong. He also said to like y'all, to turn back the timing a little and run it down the road to see if it helps. The tube on the left valve cover is a vent for the valve cover. It normally goes to a connection on the side of the air cleaner housing. The EGR would be located between the carburetor and the intake manifold. It is normally a plate about 1/2 inch thick. Look at page 29-01-4 in the Gen 6 maintenance manual section under emissions. It shows a drawing of the EGR valve on a 460 engine. It is the round metal diaphragm toward the back of the engine underneath the carb mounting plate. There should be a vacuum line that runs to the EGR valve. He did mention a delete plate or egr plate. I'll look at what you referenced. The vent on the valve cover not being hooked up to the air cleaner couldn't contribute to the detonation could it? I don't mean to be so ignorant. Thanks for all the help. I don't think the vent line would have anything to do with detonation. My limited experience says detonation is a timing issue as Supercab stated. Pretty sure there is supposed to be a plate/spacer under the carb that was what the EGR would mount to. I have seen occasions that motors get warm enough to boil gas out of the carb, and the fix for such? Spacer plate. 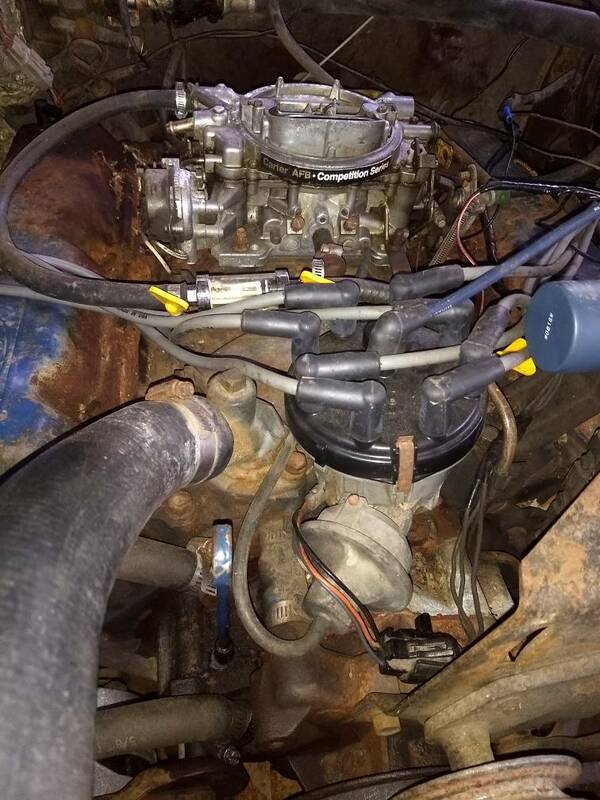 Had a 454 Chev that I had to double up the carb gaskets which on that one were about 1/4" thick. Might pick up anaftermarket spacer/adapter and get that space back if can't find an egr plate. It also helps with fuel atomization a bit. Some of it also sounds like the carb itself may be gummed up and nasty from sitting. Nice thing with the Edelbrock(Carter) carbs is that they are VERY easy to service. A friend recently bought a camper that was sitting for a few years and had one on it. He hadn't dealt with them so didn't know how to work on them, so I took it apart and it was just total varnish inside. Did manage to get it cleaned up and worked just fine. The fuel overflow sounds like it had stuck a float or needle. Those have 2 floats and needles in them. You just take the top off the carb and everything is right there.